I love perfume, and for me, it is something fun to write about. It relieves stress, is fun, and has allowed me to learn so much about fragrances and the perfume industry since I started this blog. I just like fragrances for the joy they provide. Having done very little to seemingly whittle down the remaining selection of samples I have, I really said to myself that I ought to stop ignoring my passion for smellies under the pretense that I’m “busy”. Busy doesn’t excuse the fact that I need to do something I enjoy or go crazy from nothing but work. So I went back to my notes, re-sniffed the things I meant to re-sniff and here I am, Scarlet Larkspur, months too late but better than never! In Bottle: Light and pretty, cherry with a bubbling start and finish and a spicy support. Applied: Cherry, like red cherry cola upon application. I feel like I sprayed the essence of a classic soda I once tried. 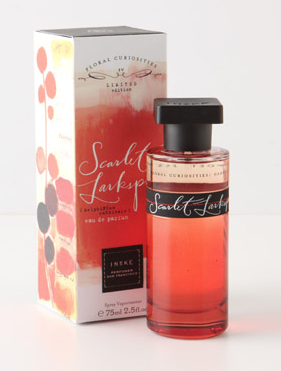 Scarlet Larkspur tickles the nose then fades into a pretty spicy floral in the mid-stage with a woodsy backing. There’s a nice clean depth to Scarlet Larkspur that I’m starting to recognize in the entire line. It’s easy to approach, gentle and not overwhelming or loud. This smells like a fragrance I wear when I want to relax. Extra: Scarlet Larkspur is a member of Ineke’s Floral Curiosities collection. Design: I really love the design of the entire Floral Curiosities line. Simple bottle shapes, but with beautiful literary imagery with swooping typography and a vintage motif. Notes: Wine, cherry, currant, saffron, florals, amyris wood, tonka bean, vanilla. No vanilla in this, but I don’t think it really needs it. At least, I got no vanilla. I was perfectly happy with the cute soda-like opening and the mellow, relaxing florals in the middle. The woods note in this is fantastic too. Reviewed in This Post: Scarlet Larkspur, 2013, Eau de Parfum.